Essential oils are volatile scented substances which are extracted from plants by steam distillation.They may be derived from flowers, fruits, bark, leaves, seeds and even roots. The huge amount of plants needed to extract just an ounce of essential oil of a given type explains their high price. For example, to extract a quart of lavender oil you would need over 80 pounds of flowers. Of course, prices also depend on the type of plant used to extract the oil. Essential oils can be consumed in many forms, but diffusing the oils is one of the best ways to enjoy their therapeutic effects. This is because when the diffused oil is inhaled, it is easily and immediately absorbed, finding its way to different parts of the body, including the brain, and providing us with benefits such as stress reduction, relaxation, immune system boost, and an increased ability to better concentrate. In addition, diffused essential oils can improve our immediate environment by purifying the air of certain pathogens such as bacteria and viruses, eliminating mold, and filling the air with a pleasant fragrance. Note that the benefits of inhaled essential oils are the object of aromatherapy, a form of alternative medicine that uses these oils and other aromatic compounds for the purpose of altering a person's mind, mood, cognitive function and health. Though the existence of these benefits have not so far clinically been proven beyond the shadow of a doubt, there have been scientific studies that have found correlation between essential oils and the aforementioned benefits. But more important, millions of people have reported essential oil related improvements with respect to their personal well being as well as environmental conditions. There are four type of essential oil diffusers: Nebulizing (also known as Atomizing), Ultrasonic, Evaporating and Heat Based. In this article, we will address only the Nebulizing and Ultrasonic diffusers. This is because Evaporative and Heat Based diffusers usually have minimal therapeutic benefits and are mainly good for aromatizing the immediate environment. 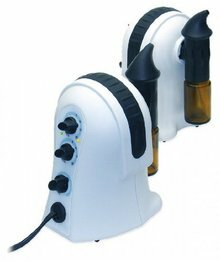 Nebulizing (or atomizing) diffusers use a pressurized high speed air stream and a specially adapted atomizing nozzle to break down the essential oils into micron sized minute particles and diffuse them at a highly accelerated rate of evaporation. Nebulization is absolutely the best way to obtain both therapeutic healing value and fragrance propagation from essential oils. As no heat is used, it does not modify the chemical composition of the oils, but simply breaks them down into particles small enough to be absorbed rapidly by the lungs, brain and other parts of the body. As mentioned, these diffusers will benefit you most from the therapeutic effects of essential oils because their cold diffusion process does not alter any of their beneficial properties. In particular, the negative ions that are released during diffusion can have a positive soothing effect on stress. In addition to health benefits, this type of diffusion is very effective in aromatizing the immediate environment without humidifying the air, which can be an advantage for people living in homes prone to moisture. Occasional cleaning is required to prevent oil residue on the pump or inside the atomizer, but cleaning these units is usually very simple. The pump can simply be wiped with a damp cloth, and the atomizer soaked for a while in some cleaning solution. Some of these diffusers may be slightly noisy due to the operating pump, but the best brands are practically silent. As these diffusers work powerfully to rapidly fill the air with essential oils, they tend to use the oils at a higher rate than any other type of diffusers. But the best brands have multiple output control levels that help regulate the amount of essential oils used. The nebulizing diffusers that have been popular among Amazon customers are the Aroma-Ace Essential Oil Diffuser and Aroma Whisper Oil Diffuser . These represent the "ultimate" in therapeutic diffusion, and they all work in a similar fashion. They are composed of two main parts: a pump unit with control buttons and an atomizer unit that contains the nebulizer. The control buttons regulate the amount of oil to be used and the operation intervals. To diffuse, you screw on the atomizer onto the small essential oil bottle and attach the combined bottle-atomizer assembly to the pump unit. When you then turn on the unit, the oil in the bottle goes up the straw of the atomizer and hits the nebulizer which breaks it into micron size particles and is diffused out. Note that the Aroma Whisper Oil Diffuser has the additional advantage of being completely silent. It is he world's first and only silent cold diffusion aromatherapy atomizer. Abundance of micro-fine oil droplets. Output volume control for easy adjustment. Advanced Aromatherapy is the same product as Aroma Ace marketed under a different name. The world's first and only silent cold diffusion aromatherapy atomizer. Stylish base is designed to fit most any 15ml bottle. Includes 2 quick-change atomizer attachments that makes changing Essential Oils a breeze. Ultrasonic diffusers also produce minute particles that are absorbed easily by the body, but the difference here is that a small amount of water is also added to the diffuser together with the oils, and the particle mist that is diffused is a combination of water and essential oils. Ultrasonic cold mist technology uses high frequency sound (100 times beyond human hearing) that generates sonic bubbles in the water. As the bubbles implode, micron size droplets of water are released from the surface. Each is enveloped by a fine coating of essential oil as they float up and rapidly become part of the air in your room. Because of the added water, this type of diffusion creates a pleasant mist that humidifies the air, spreading evenly throughout your room, and therefore these diffusers are ideal for particularly dry homes. Note that the ultrasonic process that transforms water and oils into a particles filled mist does not use any heating, and therefore the beneficial elements of the essentials oils are not altered. On the other hand, because of the presence of water, only a small fraction of the mist will actually contain essential oil particles. However, for the very same reason, these diffusers are more economical than nebulizing diffusers and will require lesser quantities of essential oils. As no heat is used, the active beneficial elements of the essential oils remain intact. More economical than nebulizing diffusers (due to the addition of water). The fragrance propagates very quickly. It also humidifies the air which allows for soft inhalation that is non-aggressive for the sinuses and the eyes. Due to the dilution of essential oils in water, the beneficial effects of the essential oils are not as pronounced as with nebulizing diffusers which use no water. Occasional cleaning is required to prevent oxidation and hardening of the oils on the bottom of the unit. Easy to use, safe, silent ultrasonic diffusion with patented umbrella cap allows excellent diffusion of essential oils. Advanced technology with energy savings features. Micron-sized essential oil droplets with no heat or air pumps. Five different time settings and three different dispersion levels with auto shut-off. Relaxing and mood enhancing low level LED color light with ON / OFF switch. 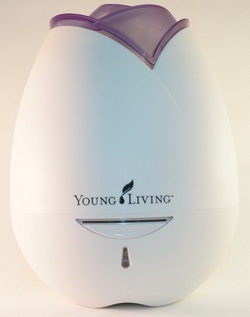 Combines humidifier, air purifier, atomizer, and aromatherapy diffuser into one simple-to-use product. Ultrasonic technology breaks any mixture of essential oils and water into millions of micro-particles & disperses them into the air. Can transform any space into a spa-like atmosphere. Alternating 30-second on/off and continuous run settings. Custom designed with ambient light control. Ultrasonic (70 +/- 10ml/h particle dia. 5 microns). Handcrafted natural wood base and hand-blown glass top. Plays soothing Chinese music using it's built-in speakers. Can connect to an external MP3 player or iPhone. Music changes along the light (Blue / Purple / White ). Strong aroma (auto shutdown time: 1 hour). ​Moderate aroma (auto shutdown time: 2 hours). ​Gentle aroma (auto shutdown time: 3hours).